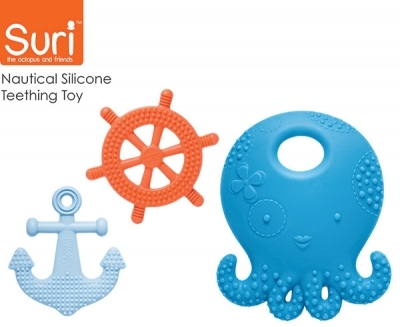 Suri the Octopus and Friends teething toys is Mayapple Baby's award-winning set of three nautical-themed teethers made with medical-grade silicone. Suri, The Anchor and The Wheel -- babies love The Superheroes of Teething! Mayapple Baby's award-winning set of three alphabet-themed teethers, made with medical-grade silicone. Each feature deliciously translucent colors, ridges and a chew ball. Teething is easy as A-B-C! All Mayapple Baby teethers are designed for all teething stages, and available in both sets and singles!